Great info, Bob. Its a common question. 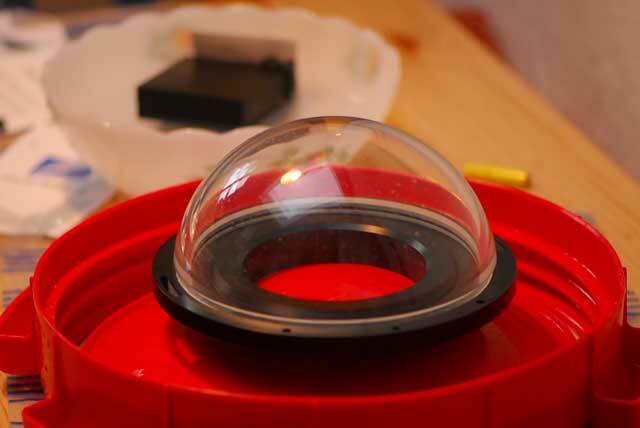 Now we need something that will work on glass domes too! They do Alex. It's called a credit card. Nice finishing product looked like new. This is what we use on Shear Water, and we've had great results with it. Jim Abernethy has been using it for a while (I got it from him) and a number of customers on our boat have also been happy with the results from it. 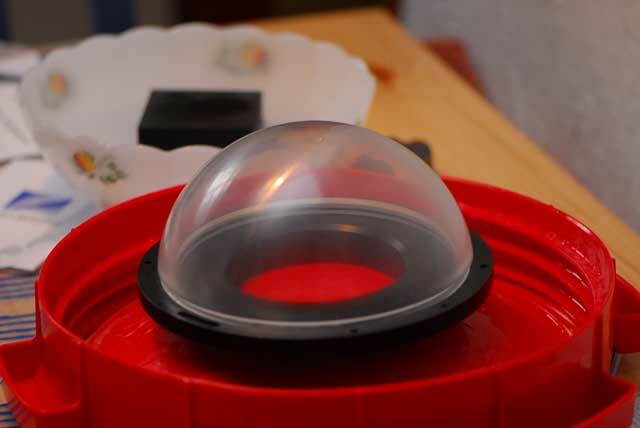 About halfway through my Kona trip a couple of weeks ago, I noticed my Ikelite Dome Ports were getting pretty worked. 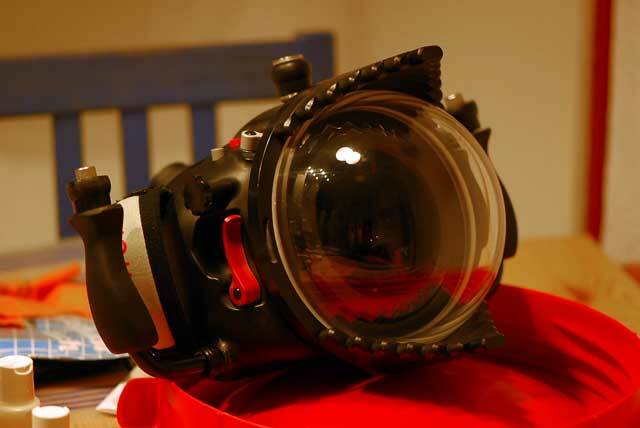 I dive the D70 rig. I don't get it. I keep the cover on until I get under water and then pocket the cover. I cover it up on the ascent. I'm pretty much a nut about it. So I couldn't figure it out. Then I noticed (on about dive 15 of the week) - when I'm clipping off the rig (when there's nothing to shoot, on a long swim, etc.) it would sometimes swing around and the domes would rub against the very tough webbing (I dive a BP) of my shoulder strap, waist band and was probably hitting the buckle. Bottom line - I was trashing my domes. 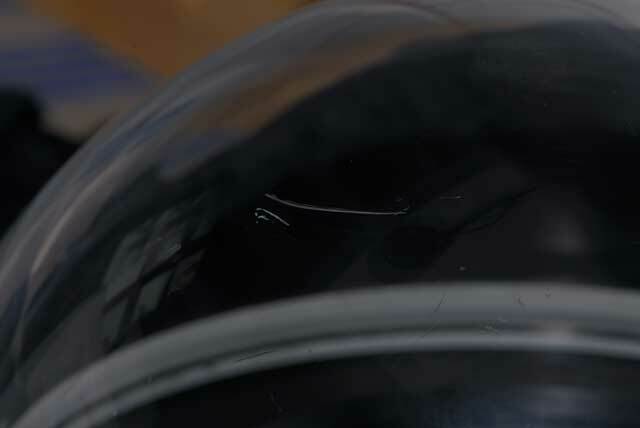 You could actually see the scratches in the pictures (especially on the 10.5 where I'm focusing on the dome its self.) So I get home and hit wetpixel - I'm thinking there must be a fix for it. I find this thread. Genius. The kit is a 10 level polishing kit. 9 fabric sand papers (1500 - 12000 grit) and a finishing polish. Then an anti-static cream thingy. I didn't think the scratches were severe enough to go to Home Depot and pick up some 300 or 400 wet paper - so I started with the enclosed 1500. After the first couple of fabrics, I also basically had a diffuser. But I could see the kit working - taking off just enough of the material to get to the deep scratches. By the time I got to the 6th level, it started to come together and I could actually see through the thing again. When I reached the 12000 grit, it was looking not just better, but almost NEW again. I'm serious - a 30 to 35 minute investment and my dome was fixed. A little water with dish-soap in a spray bottle, a little sanding, a little buffing and they're all better. This is so liberating. 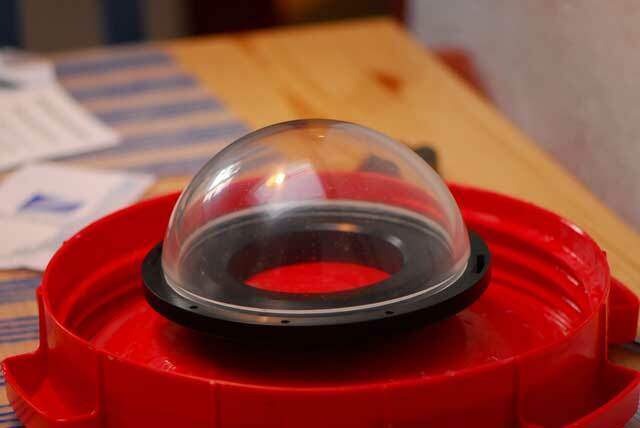 I mean, now that I found the cause of the problem, and have now secured a way to repair the domes, its a complete relief. 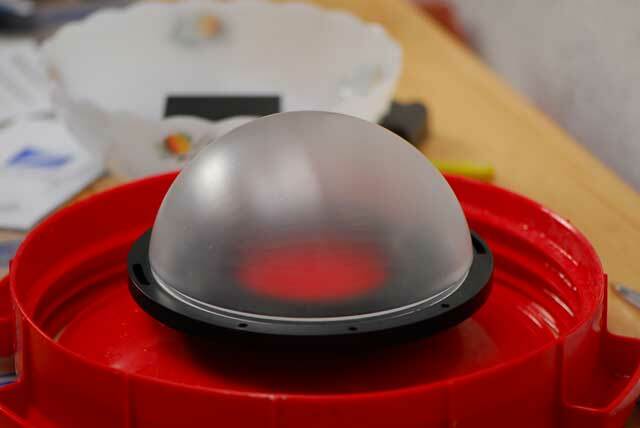 I can't recommend this kit enough for Ikelite-type domes. The flat port was a little more challenging, as I can't get off the port with each successive pass - so I just used the finishing polish. 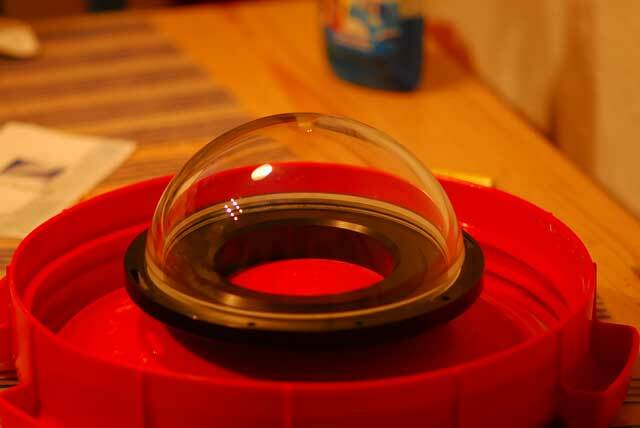 Made a huge improvement, but its not in NEW condition like the domes. I may try the Nouvus on the flatty. I'm pretty fired up. 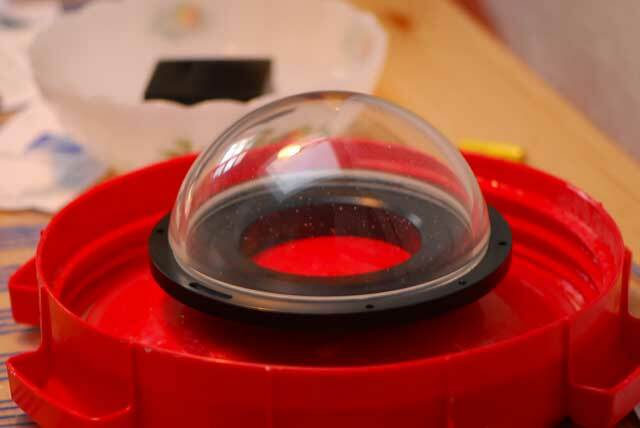 Now that these things look great again, I can eBay these two domes and step up to Ike's new 8" mega dome. I've tried Novus, it's a lot of work and is best only for light scratches. I also have the mesh kit. Haven't tried it yet but my expectation, based on this thread is that it will work better/faster. Nikon D70 with Nikkor 10.5, 18-70, 60mm & Sigma 15mm lenses in Ikelite housing with 2 Ikelite DS 125s. I just placed an order for the Micro-Mesh NC-78-1 ACRYLIC RESTORAL KIT, I have some realy nasty scratches to restore. And again Wetpixel saves me another day :thumbsup!! 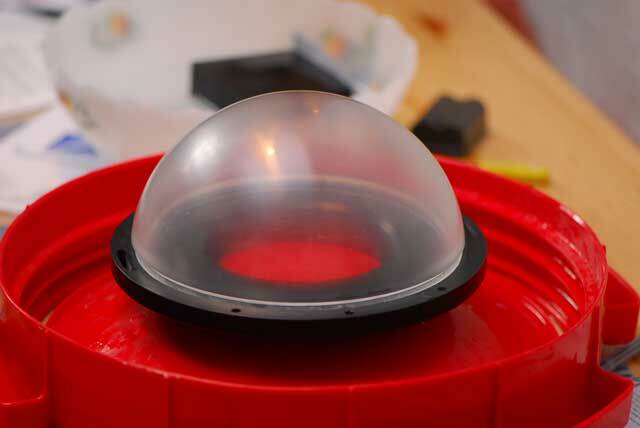 I put a deep 2 inch gash into my Nexus Dome port. This wasn't small, this thing was visible at 50 yards! I gave it to Steve at Ocean Optics who passed it onto a contact. 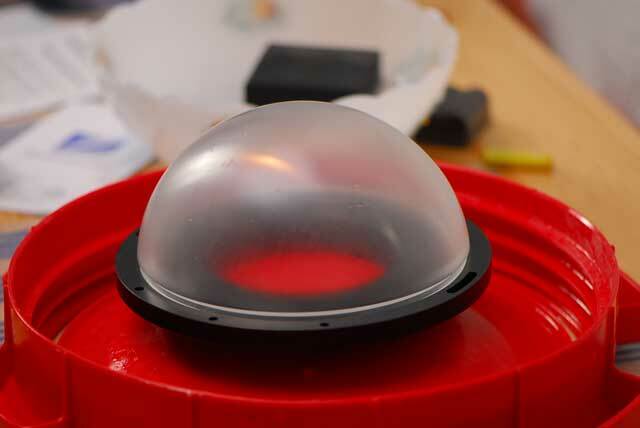 Result was I received the dome and it looked absolutely brand new - you can imagine my relief at not having to fork out for a new port. If I do get another big scratch, I'll try the tips here safe in the knowledge that I know a pro if it all goes wrong. My story is similar to that ones of the members above, but i took images of my domeport in between each step which i want to share with you. Each picture is after a treatment with different grain size papers (1500-12000). Just for your information. and finally after treatment with abrasive liquid and and antistatic treatmanet mounted on my housing. Nikon D800, D800E, Hugyfot housing, 15 mm fisheye, 16-35 mm WA, 105mm VR Macro, 60 mm Macro, Subsee +5 an +10 wet diopters, Inon Z-240 strobes (3x), Inon float arms, Nauticam armclamps, Bigblue and Inon focus lights. Interests:Stereo/3D Underwaterphoto/video-graphy, Marinelife and archaeology, diving and building cameraequipment. Thanks a lot for sharing these pictures with us! Did you just bought the sandpapers and added water in the polishingproces? Best regards from Kim Meineche who also have a port with scrathces! Edited by Kimmeineche, 05 September 2006 - 11:42 AM. 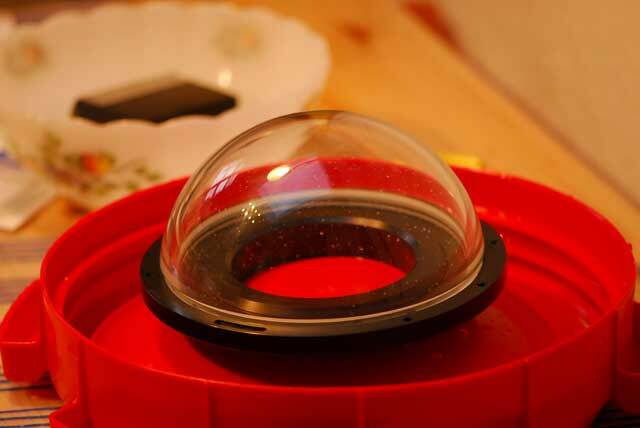 Yes, i used water with the sandpapers, but for the pictures i dried the port. Ok.... sounds quite simple if the superfine sandpapers are common availiable!? One more question: What brand/name are the abrasive liquid and atistatic stuff, mensioned at the last picture? How long did the whole process take Udo ? Well, i didn't buy all the different sandpapers separately but i ordered the Micro mesh kit mentioned in the first post. I don't know whether regular sandpaper would do the same job, you can give it a try off course, you always can restore it with the micromesh kit. BTW, the abrassive liquid wasn't really nescessary anymore since the port was really shiny after the 12000 grain paper. Probably white toothpaste has the same effect. In the kit all necessary parts are included and you're sure that it works. The kit can be used more then once. The whole process took me about 1.5 hours, most of the time with the first paper. Well, i didn't buy all the different sandpapers separately but i ordered the Micro mesh kit mentioned in the first post.